With the name “Whiplash” and the subject matter built around jazz music, particularly drums, one would expect a film that explodes from the screen and provides a beat that cannot be missed. That is just what one gets in this double time swing film, from the downbeat opening scene, to the kick drum finish. As I thought to myself, and heard from another viewer, who knew jazz drumming was so intense? Of course the answer is anyone who has ever picked up the sticks. So, in addition to being thoroughly entertaining and presenting questions as to when pushing a student or oneself crosses over into punishing, “Whiplash” pulls back the curtain into one of the most important and demanding positions in jazz music, sitting behind the kit. 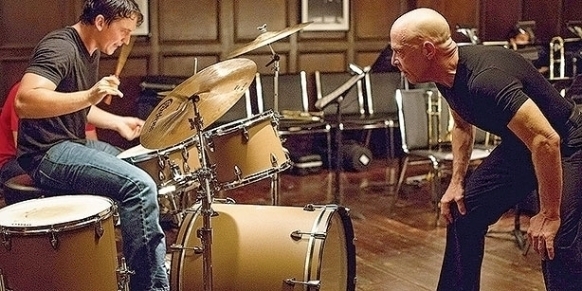 In doing all of this, “Whiplash” is also one of the best films of 2014. 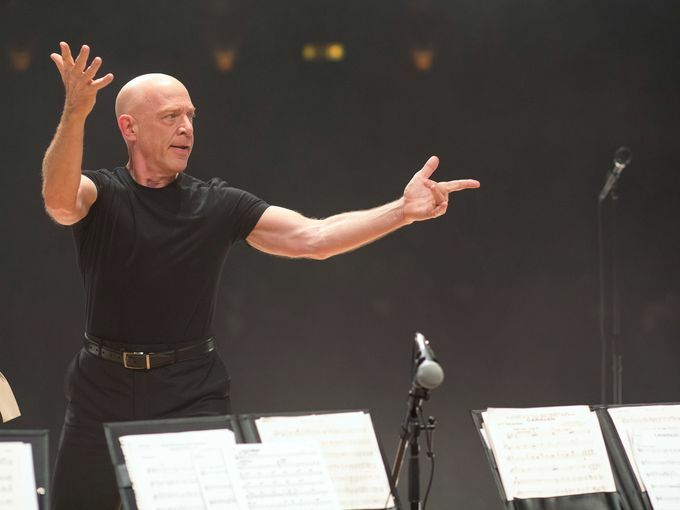 “Whiplash” is a film for anyone who loves music, especially jazz of which there is an abundance. It is also a film for anyone who likes masterful acting. J.K. Simmons, as instructor and ensemble leader Terence Fletcher, offers one of the best acting performances of this or any other year, for which he has received Screen Actor’s Guild and Golden Globe Supporting Actor nominations. Much like Anthony Hopkins’s Hannibal Lector, Simmons’s Terence Fletcher not only commands the screen when he is on it, his character fills the theater when he is not. 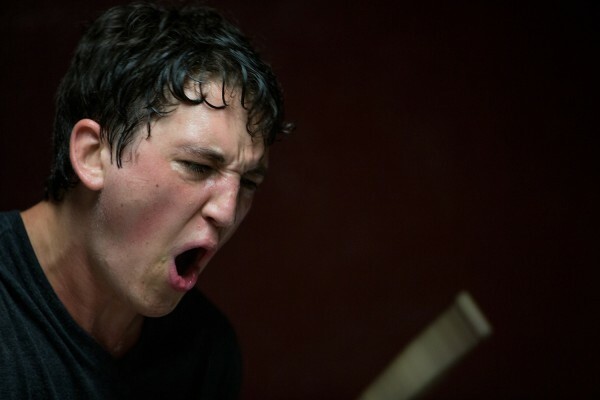 This performance is as far away as one can imagine from his droopy-eyed and lovingly understanding father in “Juno.” Miles Teller also gives a compelling performance as a resiliant young drummer determined to achieve his lofty goals. Most importantly, “Whiplash” is a film for anyone who has considered for whom they strive to live for or please in life. “Whiplash” is the story of Andrew Neiman a first year music student attending The Shaffer Music Conservatory the most prestigious music school in the nation. As with many, if not most jazz drummers Andrew hopes to join the pantheon of drumming greats such as drumming icon Buddy Rich. Success at Shaffer is the first and perhaps most important step in his journey, and success at Shaffer means joining the prime jazz ensemble. Joining the top group means catching the eye and ear of the conservatory’s notoriously demanding ensemble leader Terence Fletcher. Andrew soon learns that catching the ear and winning approval from Fletcher is easier than keeping them as the driven instructor will stop at nothing, including intimidation, humiliation, manipulation, verbal and even physical abuse to get the best out of his students. During the film the audience discovers that Andrew’s motivations to succeed are rooted in his childhood where his talent and desire to be a professional jazz drummer and musician are dismissed in favor of the lesser, division III athletic talents of his cousins who serve more as siblings in the close knit family. Andrew also desires professional greatness that his widowed father, an aspiring author who is forced to teach rather than live off his writing, never achieves. As Andrew responds to the demands required to stay the primary drummer in the number one ensemble, he becomes more focused on practicing, improving, and pleasing Terence Fletcher to the point that he breaks up with his girlfriend, distances himself from his father and other friends. In Andrew’s mind he decides to dedicate his life to his music and career. In reality he gives his life to his teacher, and it seems never to be enough for his leader who makes Vince Lombardi look retiring. After a climatic event in the final third of the film, Andrew and Terence meet in a jazz bar where Terence explains his techniques and motives. Earlier in the film Fletcher had told Andrew the story of band leader Jo Jones throwing a cymbal at the head of jazz legend Charlie Parker following a less than stellar solo. According to Fletcher it was the seminal moment that led to Parker becoming one of the greatest jazz musicians of all time. It is also the event from which the instructor takes license for his teaching techniques. In the jazz bar, Fletcher further explains that too many people settle for mediocrity rather than strive and sacrifice for greatness. Borrowing from another music oriented film, one could say Fletcher believes that too many are satisfied to be Salieri rather than pushing to be Mozart. Fletcher imparts to Andrew and the audience his belief that the worst two words in the English language are “good enough.” The more talent and potential a musician had, the more Fletcher believed it was his duty to push, manipulate, and even abuse into greatness. The ending of the film leaves it up to the audience to decide if Andrew succeeds or fails and if successful, whether it was worth the price he paid. It is also left up to the audience to decide whether Fletcher pushes or punishes and whether he does it to find the next Charlie Parker for altruistic, for the love of the student or jazz, or selfish, ego driven reasons. After his father inquires about his motivations for putting up with the torment of Terence Fletcher, Andrew states that he is is determined to please or prove himself to his teacher, because doing so could help him achieve his personal goals and ultimately please himself. Christians must also decide for whom one lives and seeks to satisfy. Dietrich Bonhoeffer famously described discipleship as “dying to oneself” so one could then live for God. For the disciple, part of dying to oneself is caring more for pleasing and honoring God than pleasing or honoring anyone else, including oneself. Jesus teaches in Matthew 25 and Luke 19 the importance of applying oneself to the best of one’s ability. God gives abilities and it honors God when such talent is developed and applied. God does not expect more than one can deliver, but God expects one to seek out to be the best one can be. Disciples are to devote their lives to serving God by developing and using the gifts and grace God has given them, and then be content with a life lived pleasing God rather than others including oneself. Contentment, while not often seen by Western societies as virtuous is portrayed in scripture as a fruit of discipleship. Philippians, I Timothy, and Hebrews teach of the importance of being content with one’s circumstances and life, something possible if one is living for God. 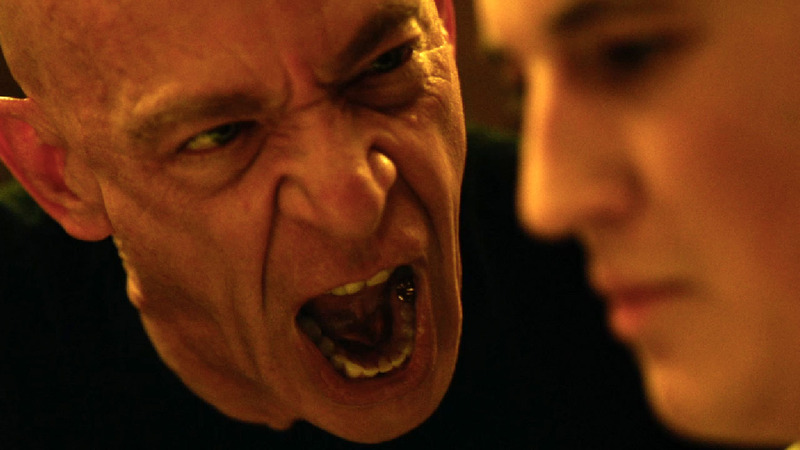 “Whiplash” is rated R for intensity and very strong, abusive language. This entry was posted in Faith Shots, Film Shots, Scattershooting and tagged discipleship, faith and film, first corinthians, jazz, jazz drummer, Jesus's teaching, JK Simmons, Luke 19, matthew 25, parable of the talents, Philippians, Whiplash film. Bookmark the permalink.